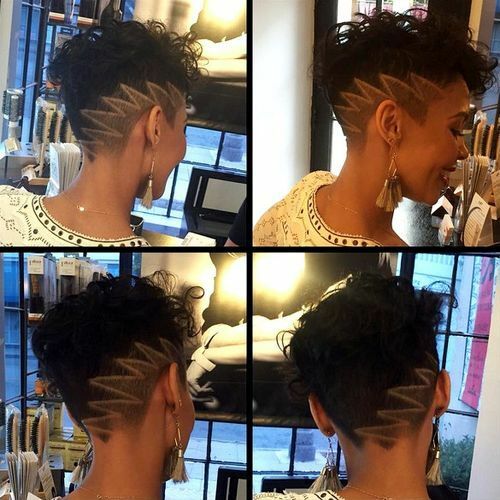 Short hair is really having a moment in fashion lately, and once you’ve taken a look at this gorgeous gallery of cool hairstyles for short haired girls, it will come as no surprise to you! We think that short hair can be every bit as fun, versatile and glamorous as long hair, which is why we’ve compiled this gorgeous gallery for your ultimate short hair inspiration! Starting the gallery with this cool and contemporary style which has totally stolen our hearts. 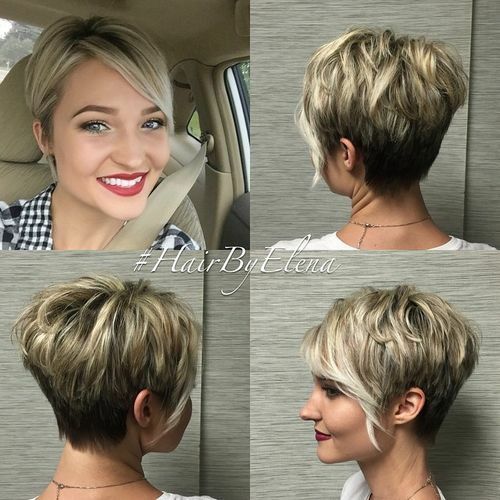 This lady has worked a unique and creative asymmetrical style – short on one side and longer on the other, into this incredible and jagged cropped look. The top layer is a bright bleached blonde, and the underneath is a more natural blonde, and we simply adore the combination. Another stunning asymmetrical look to add to our collection, this beautiful bob has a slightly longer section on one side of the hair to the other. 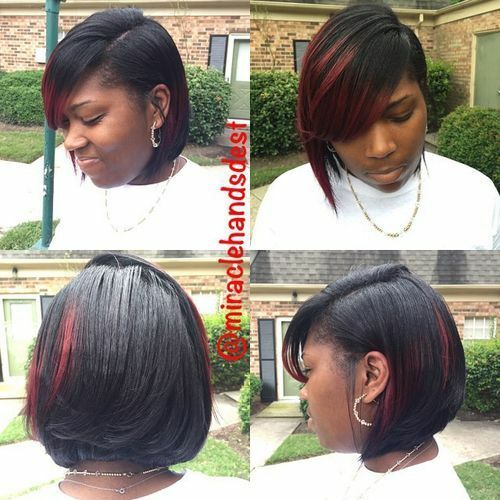 The rest of the hair is chopped into a blunt bob with a stunning curved silhouette. The hair is a stunning turquoise blue which blends seamlessly into a more royal blue at the very end of the long section, which we adore. This might just be our favourite hairstyle from this entire gorgeous collection – we absolutely cannot get enough of that bouncy silhouette! 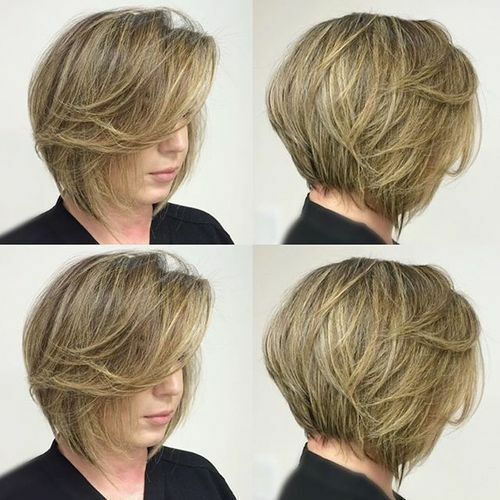 This beautiful and slightly graduated bob works from shorter at the back to ever so slightly longer at the front, and is finished with lots of wonderful caramel toned highlights. The fringe section has been swept back for the most perfect finish. The stunning Vicoria’s Secret Angel Karlie Kloss is pictured above with the most gorgeous choppy bob we ever did see! 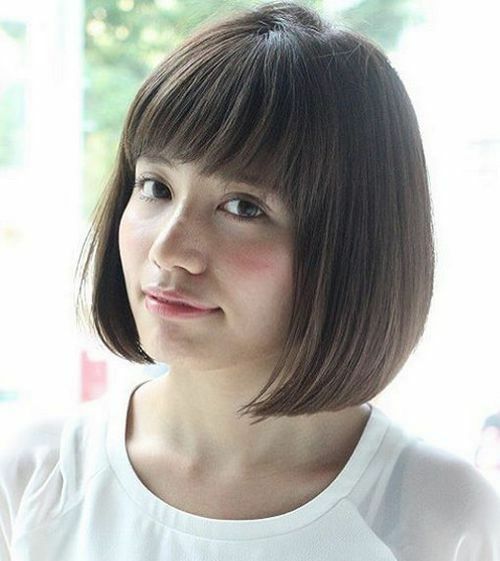 Her beautiful brown bob finishes just below the ear length and has an incredible side fringe. Karlie has loosely tousled her locks with a wave throughout, that creates the most amazing and bouncy finished result which we adore. 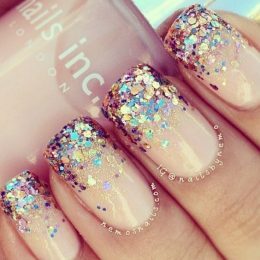 This look is bold, brave and oh so stylish – we simply cannot get enough of it! 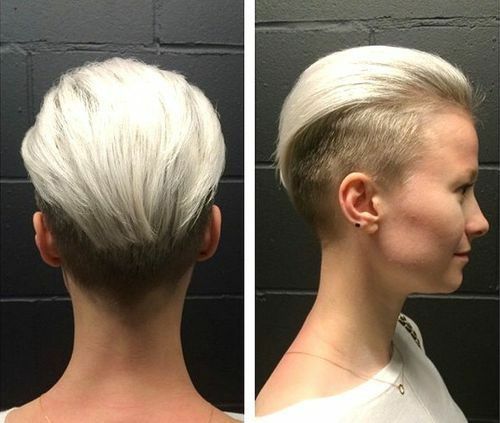 The back of the hair is a short layer which is close to the head, finished with an incredible zig zag shaved pattern creating this incredible and unique look. The top layer of hair is a little longer and full of natural tight curls, creating the perfect contrast to that bottom layer. 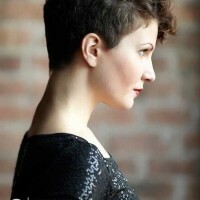 Another simply gorgeous look from our short hair gallery. The bottom section of hair is a deep and dark brown, and the top of the hair is kept longer to create this elaborate and impeccably stylish quiff look that we see pictured. 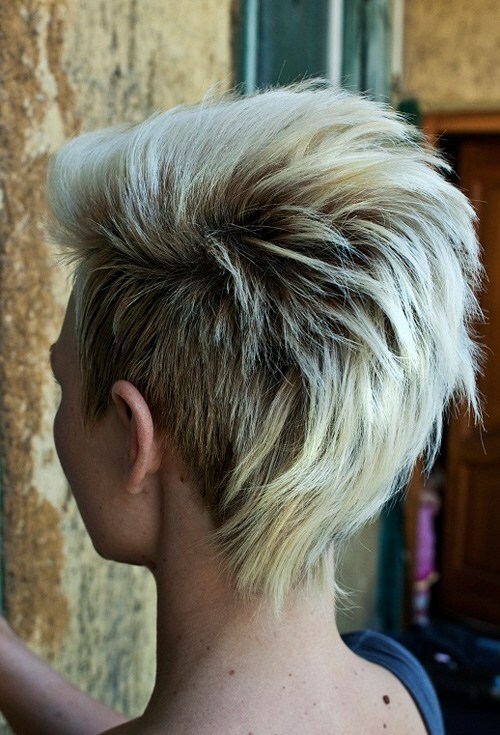 The top section of hair is full of golden highlights, which look incredible when swept back into this cool quiff. This amazing hairstyle has stolen the hearts of the Styles Weekly office – and this gorgeous girl looks like a model! Her incredible ash blonde hair has been worked into a little crop, kept close to the head, with the front section of hair worked into this amazing long sweeping fringe, which falls around the jaw level and frames the face perfectly. 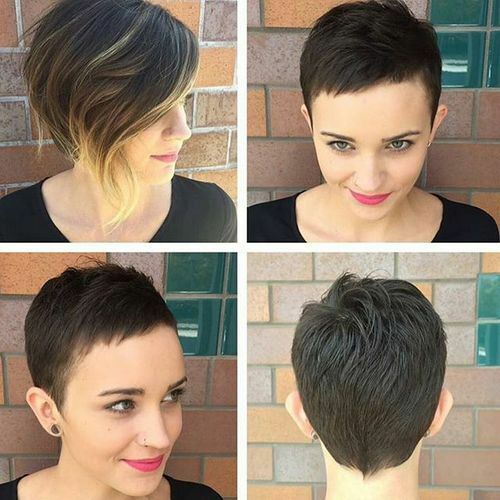 It’s a stunning pixie cut with a difference – and this girl is absolutely working it! Her incredible white blonde hair has been worked into a short and cropped pixie cut, which is so on trend right now, finished with a stunning asymmetrical longer fringe section. The fringe works from shorter layers at the top to longer layers at the front, finishing the look off in the best way. This is another wonderful bob to add to our collection – this time an amazing ombre blend of glossy black and vibrant red, blending from one colour to the next seamlessly. This lady has created a side parting, allowing one side of her hair to form this amazing swept look. She’s curled the ends of the bob underneath for this amazing silhouette. 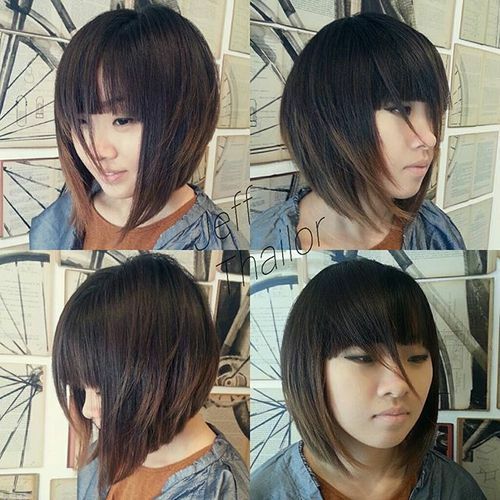 This incredible stacked wedge bob is short, stylish and full of life! With lovely short and choppy layers working from the short back section right up to the top of the head, creating this amazing and voluminous look, this bob is absolutely full of body – especially thanks to the long fringe section. We love the amazing white blonde highlights scattered throughout! 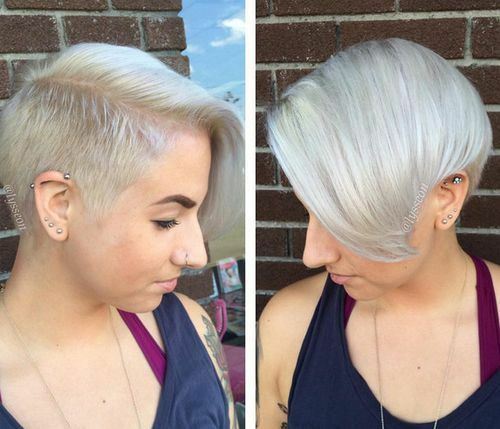 This lady has been incredibly brave with the scissors, and oh boy do we think it’s paid off! 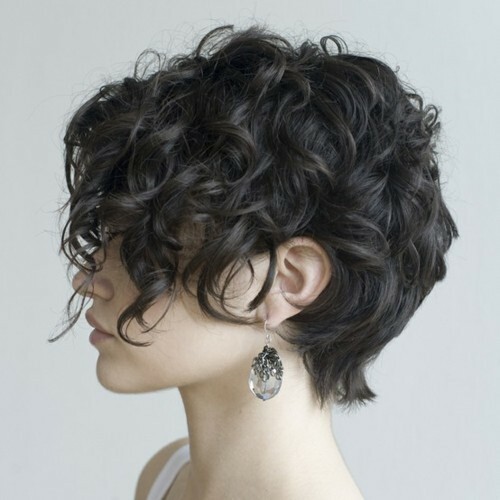 Her gorgeous and short pixie crop is kept so close to the head all over, with only the slightest of fringes found laying gently across the forehead. Her hair is an incredible dark chocolate brown and we think this cut highlights her stunning facial features! This utterly gorgeous bob is blunt, modern and beyond stylish – we can’t get enough of it! In an asymmetrical style which works from shorter at the back to longer at the front, the layers are cut perfectly to create this amazing curved silhouette. 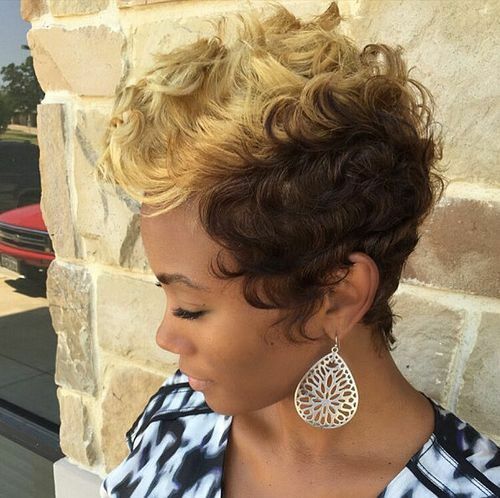 The bob is finished with a blunt, straight fringe running across the forehead, and the hair blends from dark to light brown in an ombre transition. 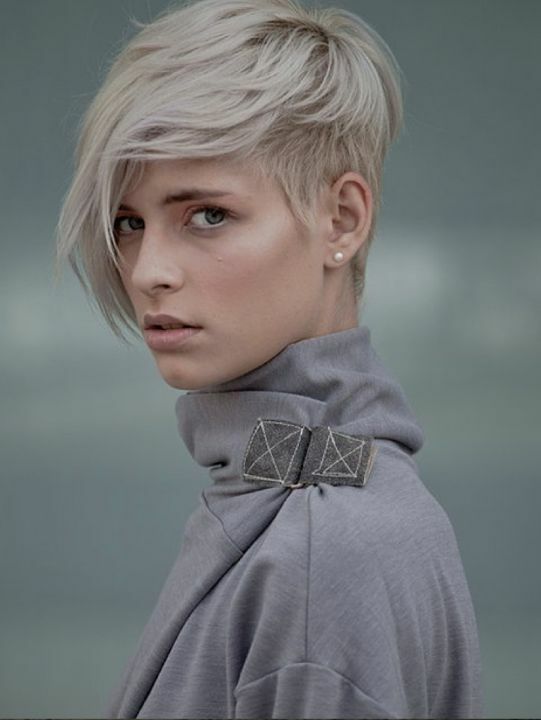 This gorgeous hairstyle consists of two layers – one underneath which is cut incredibly close to the head in a lovely darker blonde, and one which is left longer in a vibrant and on trend shade of silver. 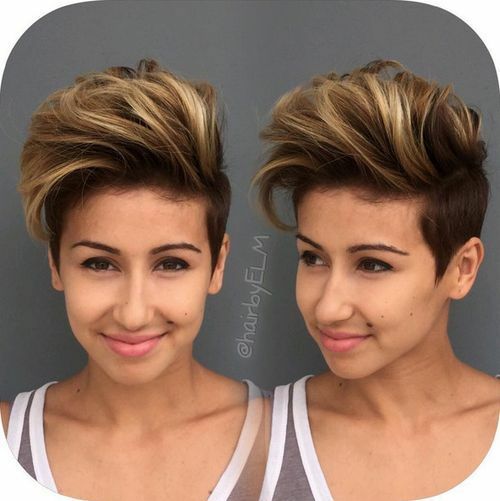 The top layer of hair has been swept back to create this cool faux hawk/quiff style which is very androgynous and oh so fashionable, don’t you think? This lovely lady is grinning like a cheshire cat – and is it any surprise when she has such a gorgeous short hairstyle? Her hair is a vibrant cherry red colour which attracts attention instantly, especially when combined with a wonderful short bob. This amazing sleek bob has a fabulous side fringe and incredible glossy finish which we think looks amazing. This gorgeous and gothic lady has incredibly striking hair which we simply cannot stop looking at! Her hair is a wonderful and glossy black which bends into a vibrant purple, taking this shoulder length bob to the next level. On one side of the head there is a shaved patterned section which peeps through underneath the sleek and long top layer. 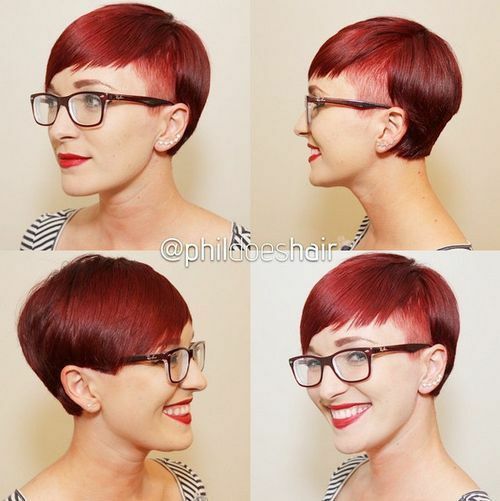 This is another pixie crop which has made the collection, and one which we simply adore! With a beautiful two-tone colour blend, a warm chocolate brown on the bottom and a caramel blonde at the top, this curly crop has the most wonderful finish. The fringe section has been swept backwards in a cool quiff so that the curls settle on top of the head in a stylish fashion. 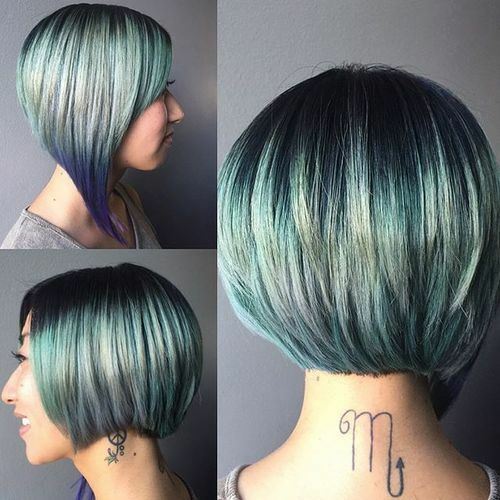 An absolutely stunning bob to add to the collection! This wonderful dark brown cut finishes just below the ear in a short bob, and is full of remarkable natural curls right throughout the hair. There are slightly choppy layers throughout the hair, especially at the top, creating an amazing finish full of volume. We adore this rich brown shade! As you can see from this before and after shot, this lady has absolutely transformed her look – and we could not love it any more! Her new look is this wonderful asymmetrical bob which starts shorter on one side of the head and graduates longer to the other side. 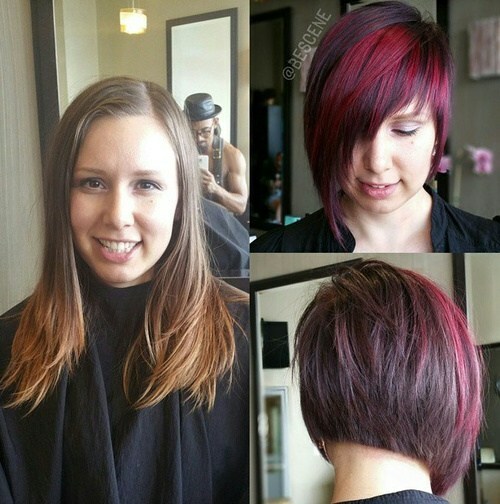 A combination of black with red highlights, this look is so stylish and cool! Another one of our absolute favourite looks, this stunning copper crop is the ultimate short hair inspiration. 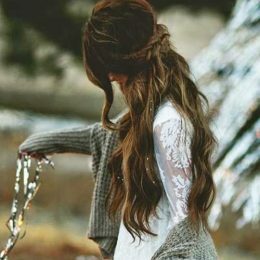 Her beautiful hair falls slightly below the jaw, longer on one side and shorter on the other, with a gorgeous long fringe section which is curled back to create this wonderful silhouette. The copper colour finishes the look off perfectly. This hairstyle really tells a story of two halves – and one which we cannot get enough of! One half of the head is cropped incredibly short and shaved, whereas the other half is left long and sweeping, creating a gorgeous blanket of colour across the head. The hair is a striking silver shade which is glossy and metallic – the ultimate finishing touch. This utterly glorious bob is the perfect way to finish our gallery, don’t you agree? Her beautiful brown bob is cut in a blunt line an inch or so below the jaw, creating a remarkable curved silhouette which is full of bounce and volume. Finished with a blunt fringe which works its way across the forehead, this frames the face absolutely perfectly. If short hair has never been on your radar before, we hope that this gorgeous gallery of crops has inspired you to take the plunge and work with a new and inspired style of shorter hair. Let Styles Weekly know which gallery you’d like to see next!